Blend 285 | Thai Spirits | International Beverage Holdings Ltd. 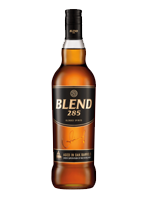 BLEND 285 is the blended spirits, meticulously made from aged scotch malts, grain whisky, and quality neutral spirits. It is bottled at Red Bull Distillery in Thailand at 35% alcohol by volume. This carefully blended liquid gives the aroma and flavour that appeals to whisky lovers. The smooth and well balanced character is offered through a notes of caramel, layered by a hint of peated malts.